Among the first Mennonite settlers were a group of more than 1300 families (about 9300 individuals) of German-Russian descent who arrived from Canada in 1922. They had been guaranteed tax concessions, freedom of worship and exemption from military service by President Obregón. At the time the Mexican government wanted to encourage more settlement in northern Mexico which had unrealized agricultural potential. After the Mexican Revolution, the large landowners in northern Mexico wanted to sell part or all of their vast holdings before the federal government forced the break up of their estates. Mennonites bought 100,000 hectares for 600,000 pesos (8.25 dollars per acre) and started a colony near Ciudad Cuauhtemoc, west of Chihuahua city. The group’s spartan lifestyle is reflected in their conservative dress habits and the fact that their villages (campos) are numbered, rather than named. The people are taller than the average Mexican, speak German, and have northern European physical features. Today, about 50,000 Mennonites live in the Ciudad Cuauhtemoc area. They also founded colonies at Patos, in northern Durango state, and near Saltillo in Coahuila. Today, there are also several Mennonite villages far to the south, in Campeche. The landscapes of Mennonite areas in northern Mexico are very distinctive. They transformed desolate areas of semi-arid scrubland into prosperous farms. Houses built of adobe on wood frames line the main street of each campo. These elongated street villages (about sixty in number) are totally different to the compact, nucleated villages found elsewhere in Mexico. Surrounding the villages are large relatively flat fields divided into blocks by wide roads. The Mennonite farming areas look more like parts of the US Midwest than Mexico. The farms are neatly kept and dotted with wind pumps used to raise water for irrigation. Tractors are common though horse-drawn buggies are also used. The main crops are wheat, oats, beans, corn and in some areas apples. 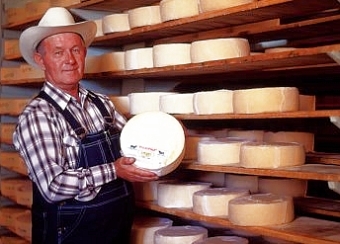 The Mennonites are experienced dairy farmers and their most famous contribution to Mexican cuisine is the production and marketing of Chihuahuan cheese (queso menonita). It is a common sight to see Mennonite men selling their delicious cheese at major intersections in several of Mexico’s major cities. The geography of Mexico’s religions is discussed in chapter 11 of Geo-Mexico: the geography and dynamics of modern Mexico. Aguascalientes’ geopolitical romance and long road to Statehood Is Mexico a major country?